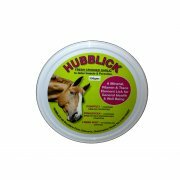 Hubblick Horse Licks are low in sugar and high in minerals, vitamins and trace elements. Each lick contains salt for good body function, phosphorus for good bone development and structure, and magnesium for its calming benefits. Available in various flavours and sizes to suit any horse in any situation. All licks are also totally weatherproof so you can leave out in the rain and not worry about any waste. Sizes available are Treat (700g), Stable (5kg) and Field (10kg). There are currently no questions for Hubblick Horse Licks - be the first to ask one!